We accept most all insurances. If we cannot fill your prescription due to you insurance be sure to ask about our cash prices. We also help medicare customers pick the right plan for them. Just ask our staff about our Medicare plan evaluation. We council patients on all new prescriptions and our pharmacists are always ready to answer any questions about your medications you may have. You can even make an appointment to speak to the pharmacist to ensure you can ask all of your questions when it is convenient for you. We offer delivery for your convenience throughout the county. Just choose delivery through our mobile app or website when refilling prescriptions. You can also ask for delivery when calling in. We offer delivery for same day fill requests if sent to us by noon. We also offer delivery to assisted living centers and nursing homes. We offer compounding services that include flavoring and custom compounding for dermatology, pain management, and weight management. 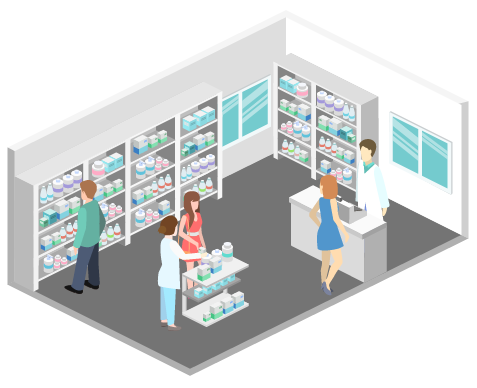 Our compounding pharmacists are certified and go through extensive training in order to ensure accuracy and safety. We offer flu shots for all ages and many other vaccines. These vaccines include Pneumonia, Shingles, Human Papilloma Virus (HPV), and Meningitis. Just come in and we will make time for you, or call in and set an appointment when it is convenient for you. Refills are ultra convenient. Call us, come in, or use refill services through the website or mobile app. Ask about med sync program to pick everything up at once! Our med sync program ensures all of your medications run out on the same day. This means you only have to come to pharmacy just once per month.